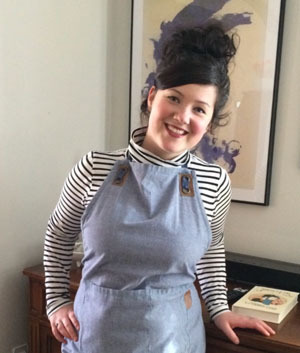 I am so very excited to introduce you to a new contributor to Art Bar. 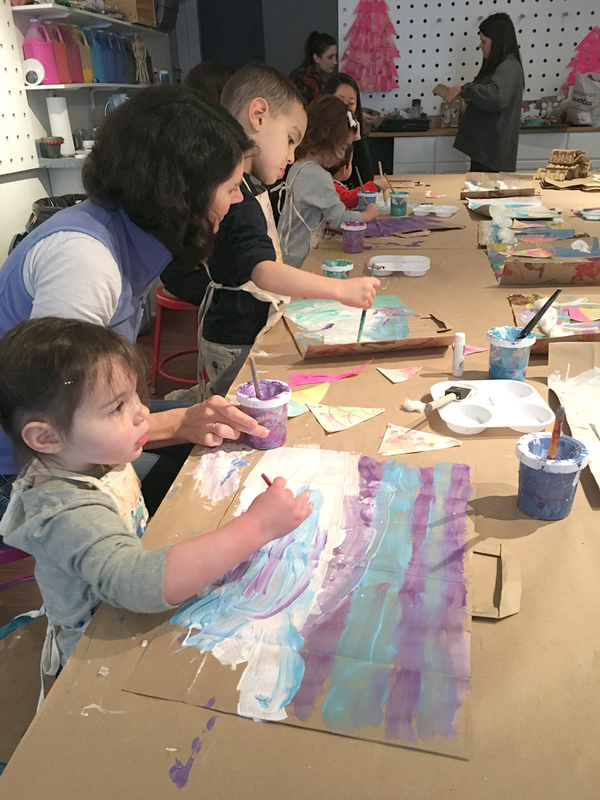 Please welcome Shannon Merenstein from Hatch Art Studio in Pittsburgh!! 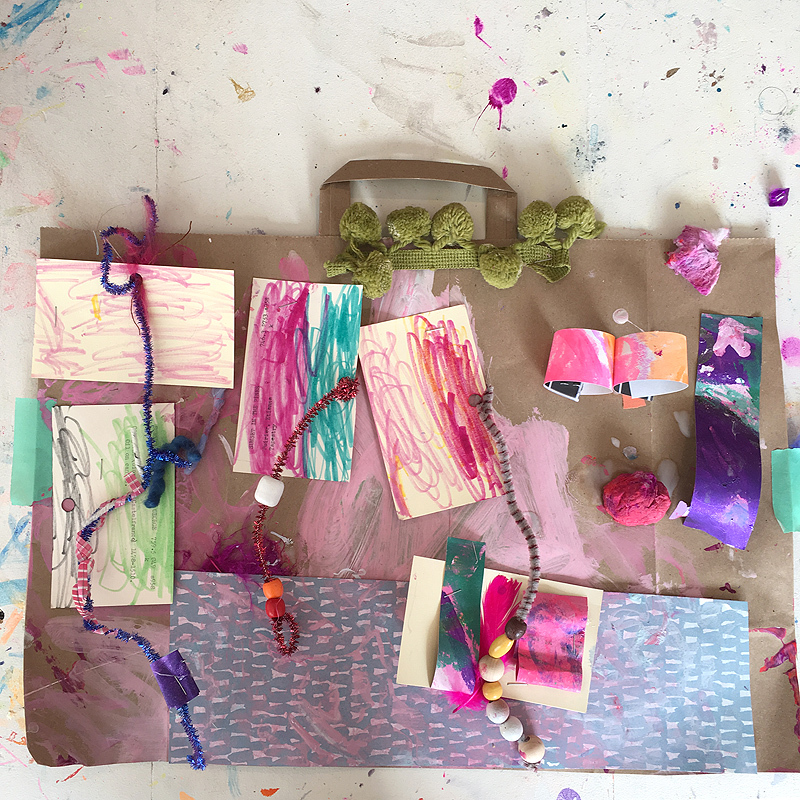 Shannon has the most beautiful Instagram feed where she shares truly original and open-ended art ideas for children. I have been so inspired by her this past year that I sent her my book to see what she thought (an art teacher’s opinion is always the most valuable). 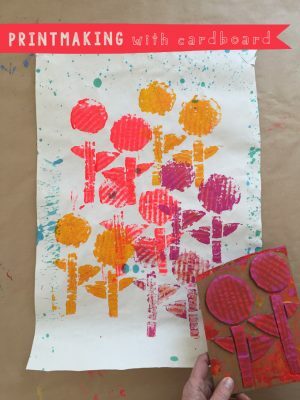 Not only did she love it, she plucked one of the workshops from my book and used it in her art class. I asked her if she could write about it here, and she said yes!!! And not only that, she said yes when I asked her if she would like to be a monthly contributor. I feel so incredibly lucky to have Shannon on my team. You guys will just die over her use of materials, she is insanely thrifty and creative. 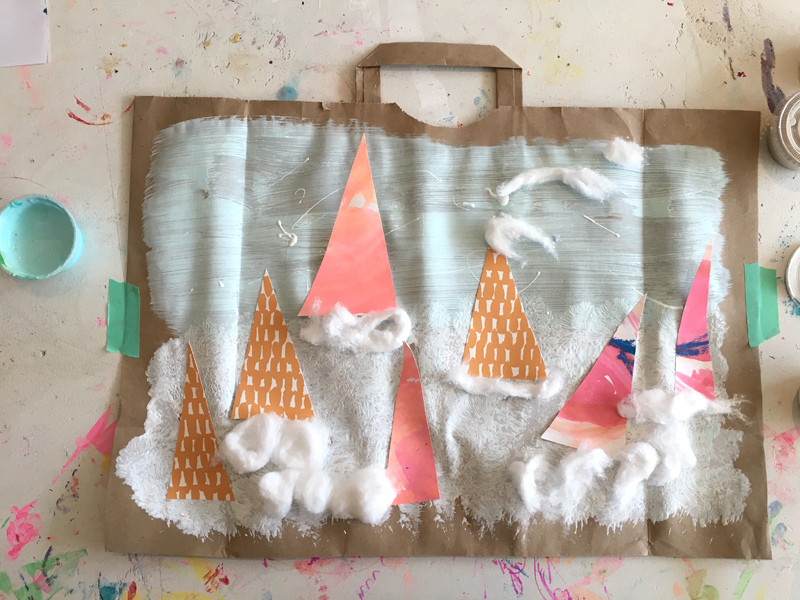 And now, without further ado, here is Shannon writing in her own words about these spectacular paper bag collage paintings! Hello out there! I’m so excited to be sharing ideas with you here at Art Bar. I’m Shannon from Hatch Art Studio in Pittsburgh! 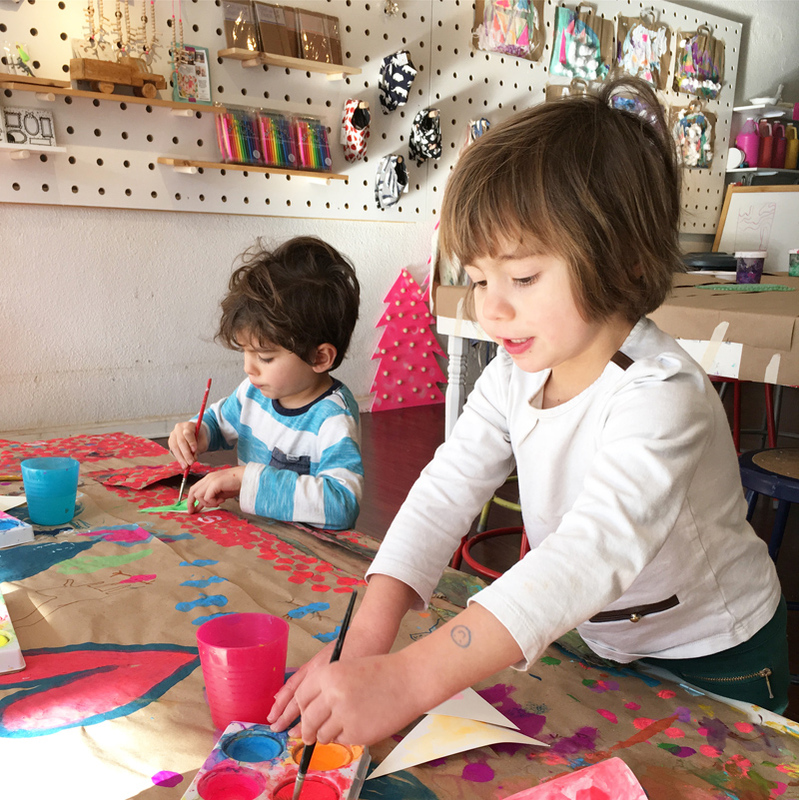 I recently received a copy of Art Workshop for Children, Bar’s amazing new book that is full of cabin fever-reducing, creativity-inducing projects for children. I love how the workshops in Bar’s book are inspiring and accessible across age groups, interests, and settings. 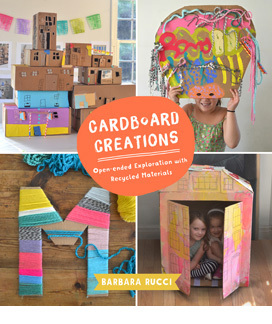 The materials in the book are easy to find, set up, and really do invite children to get creative. Enter the ordinary brown paper bag. We’ve become pretty much obsessed with transforming this unassuming recyclable (in my case, basement clutter) into a magical masterpiece here at the studio. The idea for this project comes from Workshop No. 7 in Bar’s book. 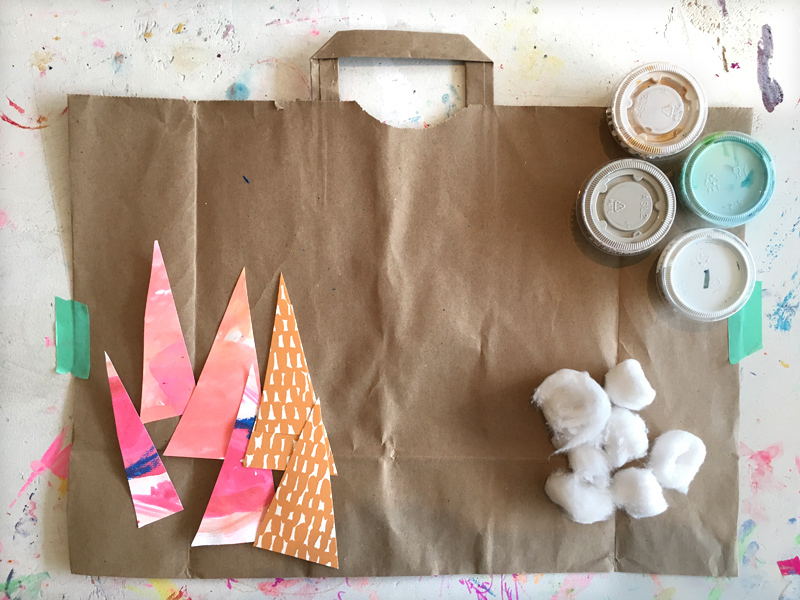 If you’ve forgotten your reusable grocery bags one too many times, you can easily whittle down your collection by setting up this invitation to create. Here’s how to do it! ~ From here, you could go two ways. 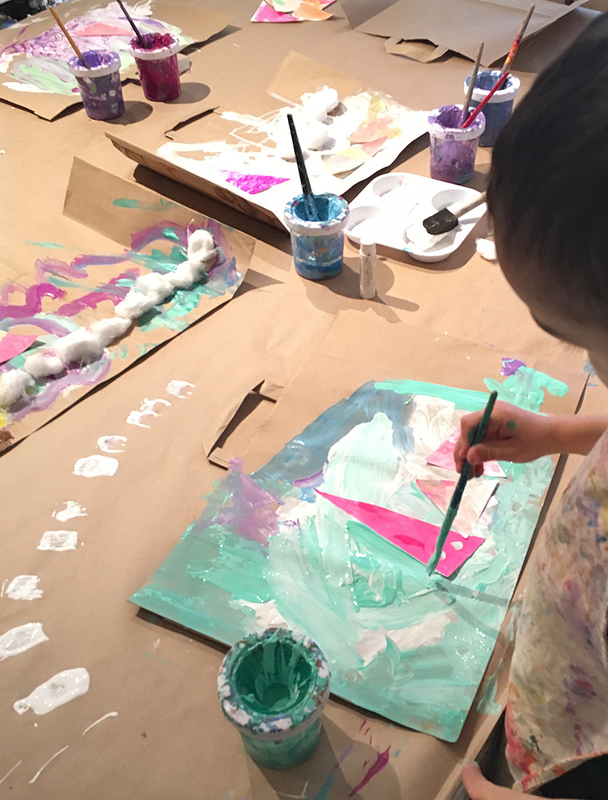 You could invite the children to paint or draw on some triangular scraps of thicker paper (like watercolor paper or cardstock). My students immediately started calling these triangle shapes mountains and trees, but also party hats, pie slices, and carrots. If you go this route, just set the triangles aside to dry for a bit. Or, you could skip this and cut some triangles from old artwork, or wall paper samples, or newspaper, or just about anything you have lying around. ~ Meanwhile, you can present your child with the paper bag as a surface (with a built in handle!) Your paper bag may or may not be a little wrinkly, so you might want to tape it down. Now it’s time to paint! I premixed some colors for my toddler/preschool age students but it might be fun to mix up some snowy day colors. I like to put my colors in little condiment cups with lids, so that they can be used again and again. The colors actually get better with kid use, in my opinion. ~ As you probably know, children will interpret this step in a variety of ways. 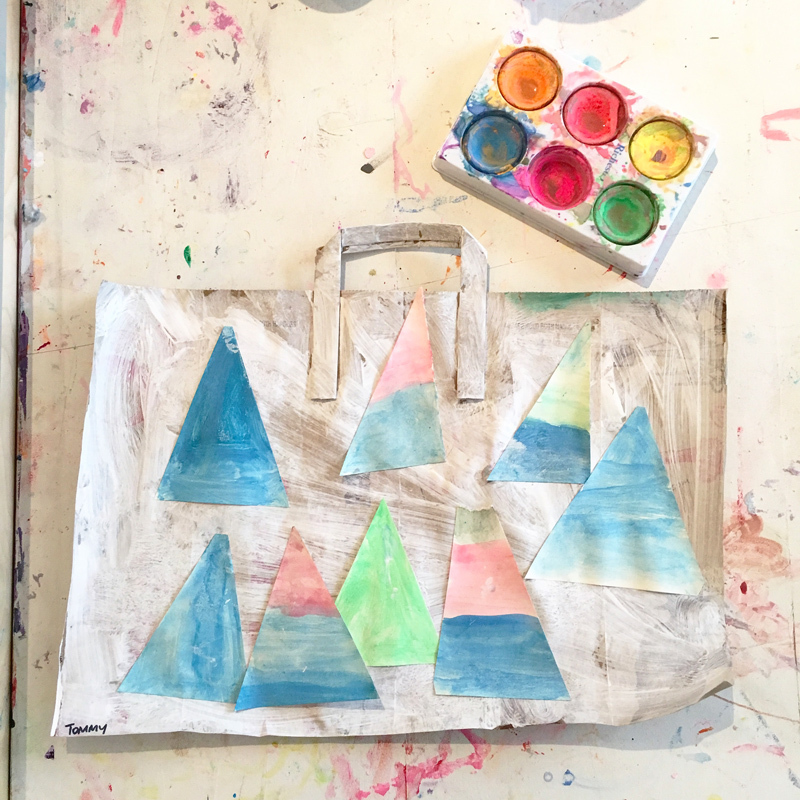 Some of my students spent a lot of time completely covering their bag, including the handle, while others applied just a little bit of paint and took interest in gluing down the triangles and cotton right away. 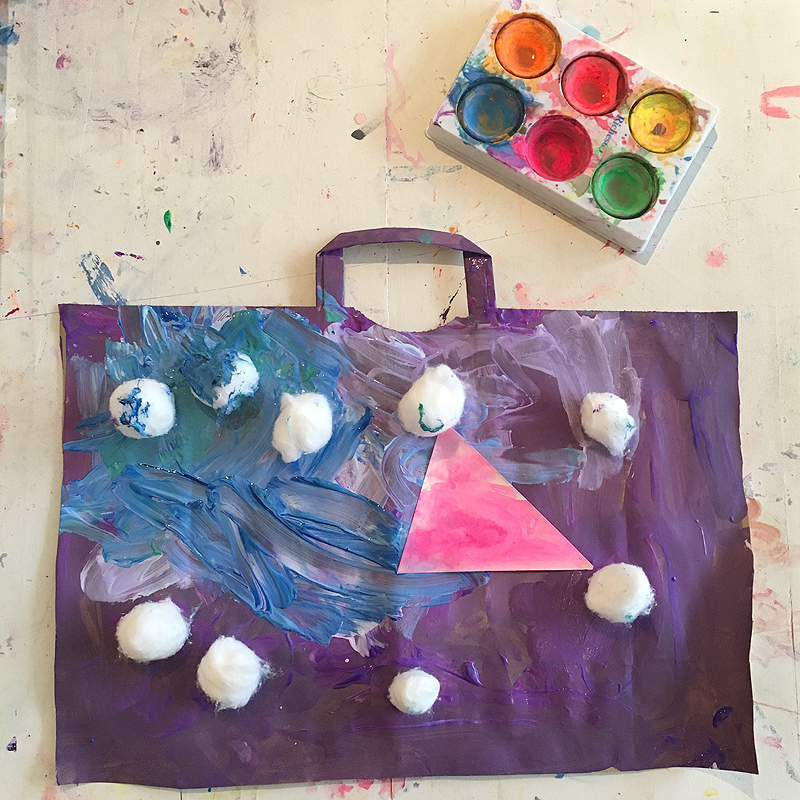 You can offer the triangles and the cotton balls during the painting experience, or after. 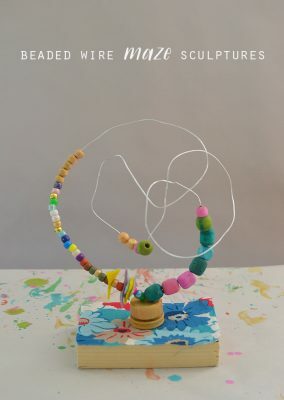 Some children like to go back and forth between the materials and I encourage this kind of decision making! Even if the paint is wet, you can still use white school glue on top and everything should stay in place once dry. 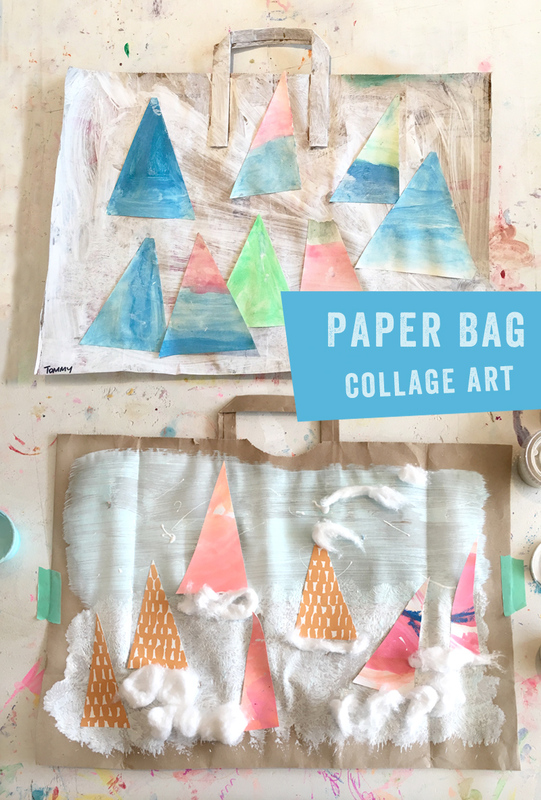 As the collaging happens, you can ask your child where they might place their triangles, and show them that the cotton balls can be pulled apart to create a different effect. When it’s all done, you’ve got a lovely work of art (landscape or not) with a built-in handle for easy display. I know it’s such a simple idea, but I just love the endless possibilities the humble and hardworking grocery bag has to offer. Thank you for sharing a little bit of your world with us, Shannon!! We all can’t wait to see what you come up with next! Love this idea!! 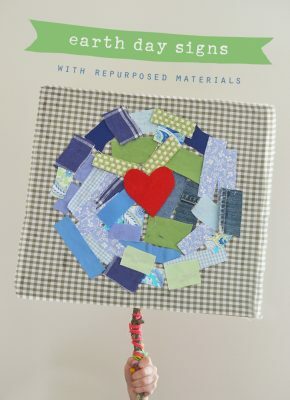 What a great way to recycle! 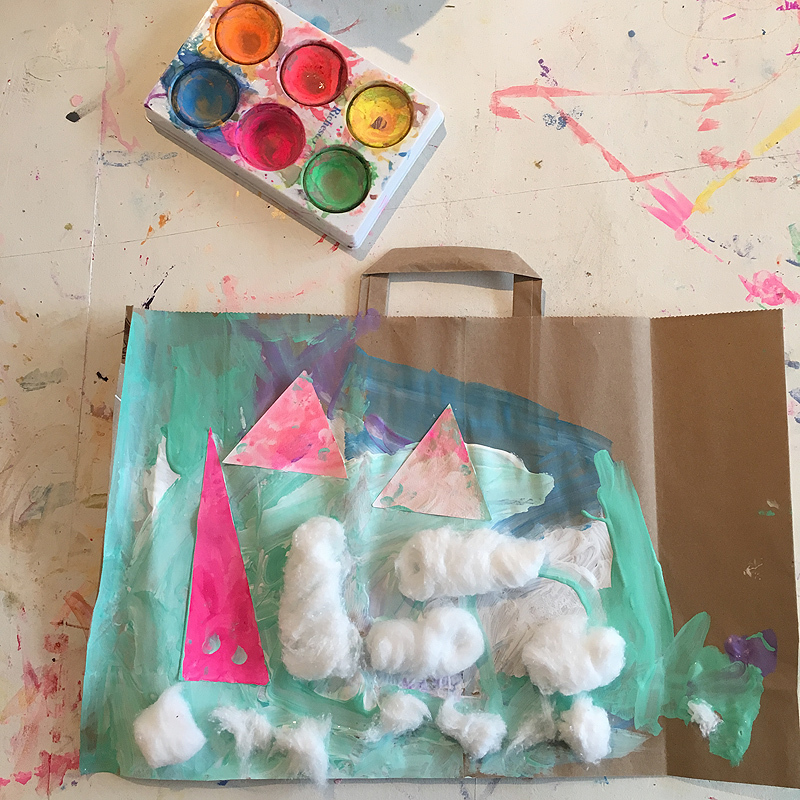 My 3-4 year olds created snowy collages. We will share them as a part of our Gallery Walk throughout our school. Love Love Love! Are those tempera paint cakes? What brand do you recommend?